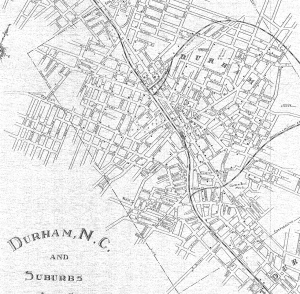 Nearly everything that has made Durham the City it is today can be traced to the brightleaf tobacco that grew in a band of poor soils stretching across the Carolina piedmont (The Golden Belt) and to the leadership of a handful of visionary entrepreneurs in the aftermath of the Civil War. Even Durham’s textile industry, which once boasted the worlds’ largest producer of cotton hosiery and the world’s largest denim manufacturer owed its roots to tobacco, and in particular to the efforts of these two men. In 1871, just six years removed from the Civil War, 32 year old WT “Buck” Blackwell and 26 year old Julian Shakespeare Carr joined with 30 year old Thomas Day to buy the Durham Smoking Tobacco Company from the estate of tobacconist John Green. Their WT Blackwell & Co. brand with its Bull logo was the genesis of the American Tobacco Company, which would eventually corner 90 percent of the American market. 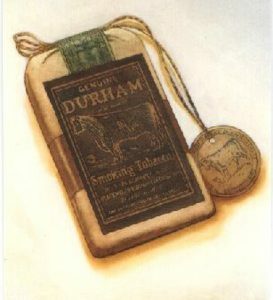 Each of Durham’s several large tobacco factories initially purchased rolls of cotton cloth to make muslin bags for loose leaf tobacco. 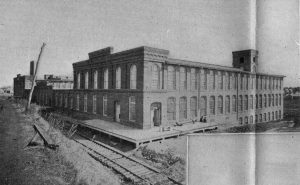 Blackwell’s 1874 Bull Durham Factory, which still stands at the north end of the American Tobacco Campus was the largest consumer. By the mid 1870’s Blackwell was buying 92,000 yards of cotton cloth per month to make the 70,000-80,000 bags needed each day. Seeing an opportunity for what is now known as vertical integration, Chapel Hill native Carr in 1884 founded the Durham Cotton Manufacturing Company, building what Manufacturer’s Record called “one of the finest factories in the country” at East Pettigrew and South Driver Streets to produce various types of cotton cloth with its 200 looms. Three years later, Carr incorporated a second company with WT Blackwell in a minority ownership role. 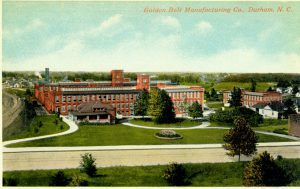 The Golden Belt Bag Factory, named for the band that wrapped these tobacco packages at first occupied a single room at American Tobacco, and made only tobacco bags – the mostly women and children workers stringing and labeling them at home for 30-40 cents per thousand bags. An average worker could do about 500 bags per day. An expert could do twice as many. As Durham’s tobacco industry took off during the industrial revolution, so did Carr’s cloth and bag making ventures. 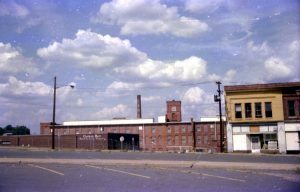 Golden Belt automated and expanded, buying the vacant factory buildings of American Tobacco predecessors the Whitted and Lyon tobacco companies on East Pettigrew between Mangum and Roxboro Streets. Golden Belt also diversified, adding bags for flour, cornmeal, and salt to their offerings. By 1900 Golden Belt had 48 machines cranking out 10,000-15,000 bags each day – the stringing and labeling still being done by women and children at their kitchen tables. Having quickly outgrown his facilities south of town, Carr began construction on a campus for an expanded Golden Belt Manufacturing Company east of town, directly across the street from his thriving Durham Hosiery Mill and situated along a spur of the Norfolk & Western Railroad. The Golden Belt complex consisted of a Romanesque Revival cotton mill (Building 1, now known as Mill No. 1) and a bag mill (Building 2) connected by a warehouse and powered by a coal fired steam boiler. The eventual extent of the campus continued to grow through well into the second half of the 20th .Above and below are photos of Building 1, the former cotton mill, nearly 400’ in length by 110’ wide, each floor comprising slightly more than an acre. 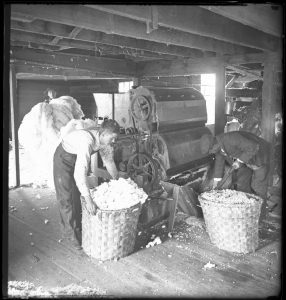 At the west end of this building, bales of raw cotton arrived by rail where it was ginned to remove seeds, cleaned, and carded using wire brushes. Long strands of cotton fiber were then drawn and roved, elongating and twisting them to lock the fibers together before they were wound onto bobbins and woven into cloth. These floors would have been packed with enormous steam powered machines driven by leather belts. It was incredibly demanding, hot, loud, and dangerous work, often for 12-18 hours each day. Golden Belt was among the first textile factories in the south to employ African American workers in production rather than maintenance, although the jobs they were given were often the most physically demanding and dangerous. The vast majority of textile manufacturing jobs were held by women and – until the late 1930’s – by children as young as 8 years of age. Like the Erwin Mill complex near Ninth Street, Golden Belt built modest homes for their workers within walking distance of the factory complex. They built an initial group of 63 mill houses in 1900-1902 and another 46 in the late 1910’s. While many have since been demolished, those that remain comprise Durham’s newest Local Historic District. Julian Carr’s grand mansion is now a parking lot, but the modest homes of his workers, sold to their occupants in the mid 1950’s are protected historic resources. This speaks volumes about Durham. 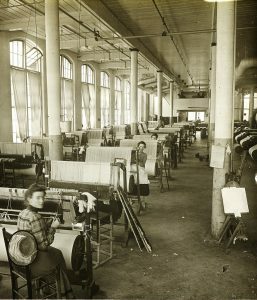 Durham’s textile and tobacco industries not only survived the Great War, the Great Depression, and World War II, but continuously adapted and thrived. By the middle of the 20th century, Golden Belt was a 94.7% owned subsidiary of American Tobacco, and had diversified into other types of packaging, labels, cartons, cloth, and bags, primarily for American Tobacco products. 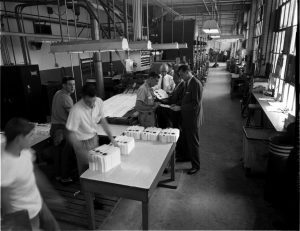 In 1965, two years before that one famous word of advice was imparted to Dustin Hoffman, Golden Belt again diversified, installing plastic injection molding machinery that begat more financial success and yet another round of expansion. A $2 million 34,000 sf addition was completed in 1968 enabling Golden Belt to churn out millions of those little plastic cigarette tips. Between 1975 and 1985 more than 800 textile mills closed nationwide, costing North Carolinians more than 100,000 jobs. Because of its association with the tobacco industry, Golden Belt held on longer than most, but by the early 1980’s, the campus – and most of Durham – was looking fairly rough. As the tobacco industry declined, so did Golden Belt, and in 1992 the sudden loss of Phillip Morris’s business cut their revenue in half and signaled the end of Julian Carr’s company. In 1996 Brown and Williamson Tobacco Company, unable to find a buyer for the sprawling and now vacant campus, donated it to the Durham Housing Authority. DHA eventually renovated one of the buildings as a business incubator and sold the northern part of the complex including the Cotton Mill and the Power House to Raleigh entrepreneur Julio Cordoba, who provided affordable space for the arts. In 2006 Scientific Properties purchased the southern portion of the complex from the City for $2.6m, embarking on an ambitious adaptive re-use renovation to reimagine Buildings 2 through 7 as artist studios, apartments, retail, and office space. The LEED Gold certified renovation was completed in July 2008. 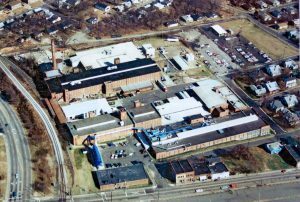 The 175,000 square foot cotton mill and the power house however continued to loom over their renovated sister buildings, windows bricked, until the entire Golden Belt campus was acquired in 2016 by New York based LRC Properties. Utilizing Historic Tax Credits, LRC embarked on a complete renovation of the northern portion of the campus, including the 118 year old cotton mill and power plant – the last pieces in a fully renovated and unified Golden Belt Campus.